What’s Your Wedding Dress Worth? Any bride will tell you that she felt and looked her most beautiful in her wedding dress. She also likely say how much she truly adored her gown. But today, instead of keeping the dress for a future daughter, brides are selling their gowns. So they can be loved again. Now. 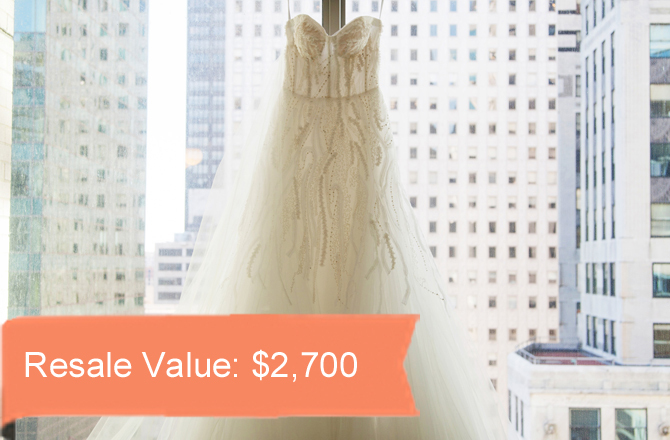 If you’re a modern bride considering resale, use our Calculator tool to determine exactly what your wedding dress is worth. Our Dress Value Calculator, instantly computes an estimated value of your wedding dress and even shows you examples of identical and similar gowns currently for sale and recently sold. It’s useful not just for a woman looking to earn extra cash after she walked down the aisle, but it can also help a bride in the midst of wedding planning factor in her dress resale into her overall wedding budget. In other words, your $5,000 dream gown can “cost” you a whole lot less than that when you consider what you can recoup if you sell it down the road. Say, for example, you’re planning on wearing the stunning Berta Bridal gown to your wedding this June. Enter a few quick numbers and facts about your dress and we’ll show you what it will be worth after your Big Day. Or perhaps you got married in August 2012 and are now ready to sell your Maggie Sottero. With a few quick clicks you can see our recommending pricing and the potential cash flow currently in your closet. 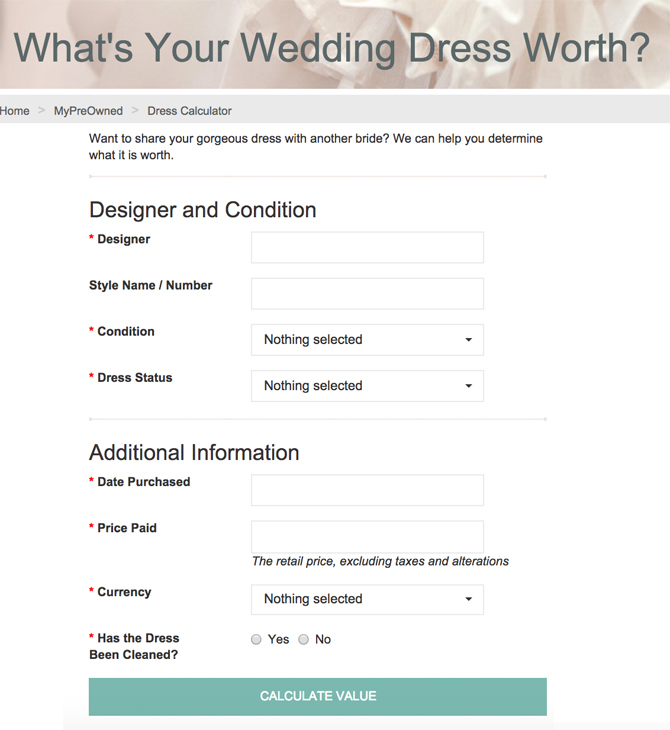 Our Dress Value Calculator will show you the value of any gown, by any designer, of any age…in seconds. The Calculator factors in all the criteria we know affect a dress’ resale value – the original cost, of course, and also the purchase date, the designer and style, whether it’s new, sample or used, its condition and if it’s been cleaned. All those factors contribute to the resale value. We’ve extracted this formula from collected from the thousands of wedding dresses brides have listed and sold on our site since it was launched in 2004. We hope our Dress Value Calculator helps you. Give it a try, and let us know what you think! 24 Responses to What’s Your Wedding Dress Worth? Can’t enter details on the website. I’d there another way to submit an enquiry? David, you can enter your details here: http://www.preownedweddingdresses.com/dresses/calculator to find your dress value. I have a long, white satin dress that my mother was married in March 1942. It’s in good condition in a box. My dress is 49 years old, was cleaned and preserved after our marriage. It is satin, with an empire waistline and has a 2-3 inch pearl beading at the waistline. I also have the head piece. Then I weighed about 118 lbs, so sized accordingly, I don’t remember. I have no idea what I paid for my Great Aunt Flora to make the dress. My girls are both married and chose not to use it. I have a 14 yr. old granddaughter who probably won’t be interested. I would love to give it to someone who is in need, if they would pay the postage costs. Hi Jocelyn, I’d recommend taking your gown to a local charity such as the Salvation Army or Brides Against Cancer. They can help you find your dress a new home! I have an Eve of Milady gown that I purchased and wore in 2006. It has be preserved and nto touched since. Any helpful tips on ho I can get rid of it? Im desperate to sell it. For personal gowns like yours, it’s difficult to assess a true market worth. Instead, in cases like these, we recommend valuing it at the price that you’d feel comfortable selling it. Hi my dress says Amy Hamilton inside but can’t find a value for my dress anywhere. Any help much appreciated thanks. I recently had my wedding dress ruined by the cleaners and it can’t be fixed. I am asking the cleaner to pay the price of the dress that it would be worth as a resale. I’m trying to figure out how much it would be worth. Please help! I have found an extremely old wedding dress made by Le Greg of California and would like to see if it is worth anything.Could you possibly help? Dress bought from Forget me not designs, dress ‘Claire’ Can you tell me how much it is worth, cleaned of course. It is in perfect condition. I don’t know the designer of my dress. I bought it at David’s Bridal in 2011 and the wedding was in October of 2011. They don’t sell it anymore and my online search for a picture naming the designer feels never ending. Worn once then was cleaned and preserved by local cleaners. It’s an A-line, taffeta gown with beading on the top and some on the hip. I even have the slip I wore under the dress. Size unknown. I’m short and skinny so it’s a small dress. Any ideas on how to figure out who the designer was? Use “David’s Bridal” as the designer. David’s Bridal is both a designer and a store. I have two wedding dresses to sell. One is a long satin with vale 1940’s, the other is a 1990’s silk ball gown style wit beaded top with vale. Both have been preserved and are in mint condition. Please advise on where I might sell there or if necessary give. the dress was worn once of course in 2014 its small size 4 has a slip & veil that was hand made.it was not cleaned. i paid $800.00 will sell it for $200.00. got it at davids bridal.beautiful dress! I have an old dress from maybe the 80s that’s a mori lee wedding dress and it has sleves and beading on it. I want to use it for my costume for Halloween but im going to need to put fake blood tht stains clothes I don’t want to ruin it. it has no serial code or anything. do you sell veil’s. I paid $150 for the veil and will never use it again. I have son’s. I’m not ready to sell my dress.